Customer research has ebbed and flowed throughout the years, so how important is it today? 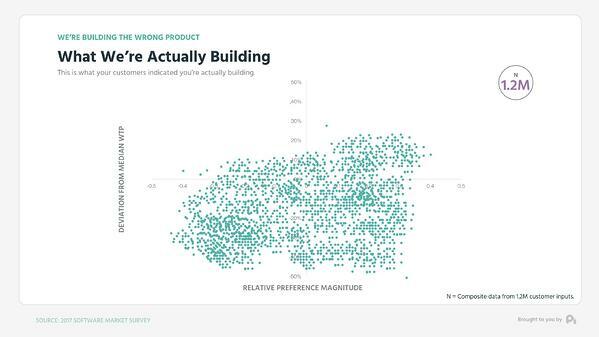 As the data suggests, it's more important than ever to do customer research in order to build the right valuable features and avoid building the wrong product. On this episode of the ProfitWell Report, Adam Blake, CMO at ThriveHive asks us to look at the current state of customer research and whether it still matters. To answer Adam’s question, we looked at just over 3,000 subscription companies and over 1.2 million different subscription consumers. Be first in line to receive fresh data every week. To not bury the lede - yes, customer research matters more than ever, but no one seems to care, which is sad. If you ask any luminary of Silicon Valley for the one lesson that matters, most will espouse the importance of focusing on the customer. 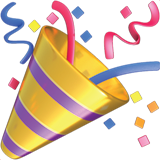 Paul Graham, Gail Goodman, Steve Blank, Mary Meeker - all of them advocate for the customer. Yet, no one’s really following their sage advice. 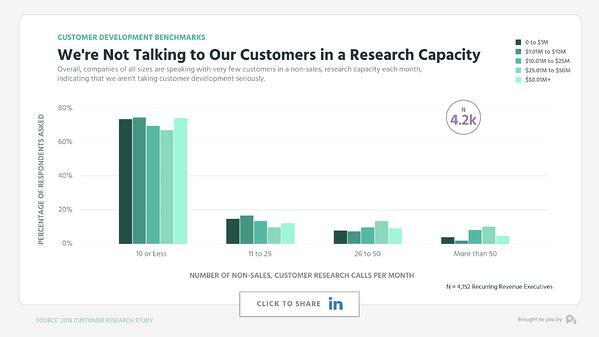 Executives indicate that 7 out of 10 of their organizations are speaking to less than 10 prospects or customers in a non-sales research capacity per month and note this doesn’t get better with a company’s size. Subscription and SaaS executives love to tell me they don’t do customer research but by God, they love to A/B and multivariate test their way to success. Hill climbing problems aside, in reality, we’re not doing tests either. 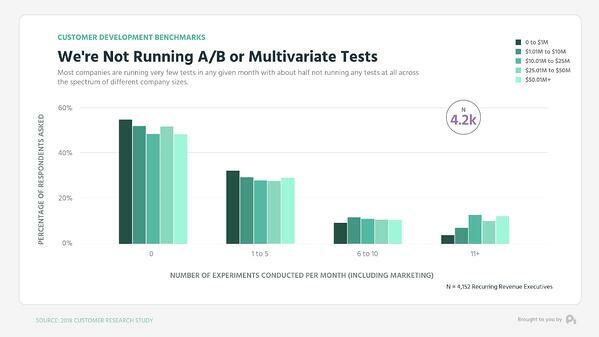 Nearly half of us are not even conducting 1 test per month and this includes marketing tests. Put simply, we love to retweet articles about customer research, we love to give advice to people about customer research - but we’re not doing customer research - and that makes me die a little bit inside, because this lack of customer research is forcing us to build the wrong product. 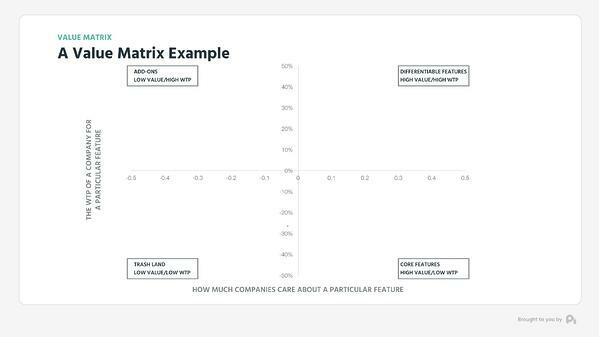 We asked just over 2,500 product leaders to plot the last N features they built on a value matrix - which cross references how much companies care about a particular feature compared to other features with how much they’re willing to pay for features. In turn, this shows us what types of features we’re putting out - be it core features, add-ons, or just plain trash. This is what your product leaders indicated they’re building for the last five thousand features they built. 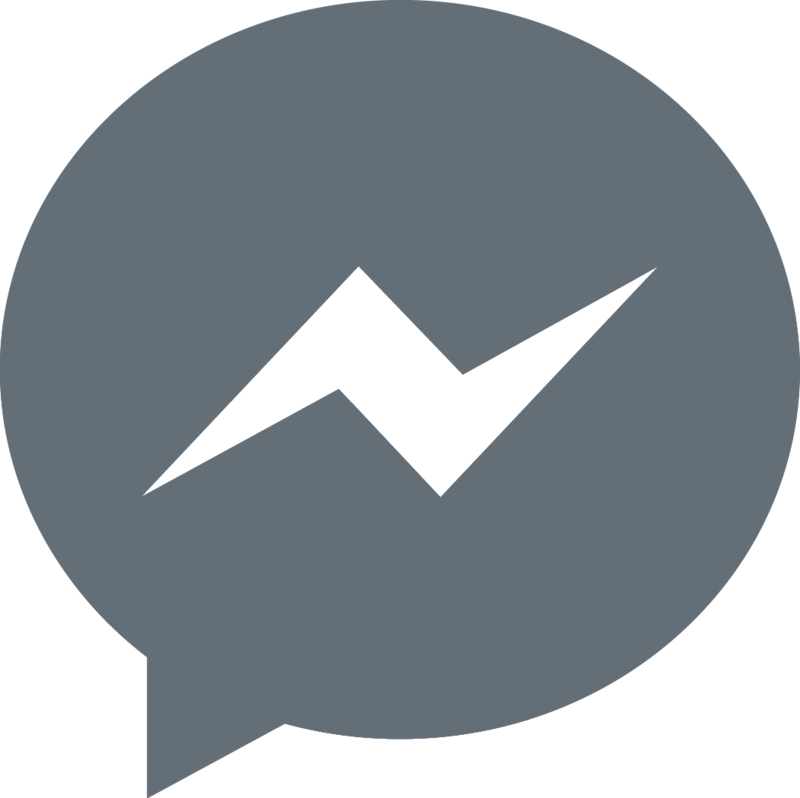 A lot of differentiable and valuable features. 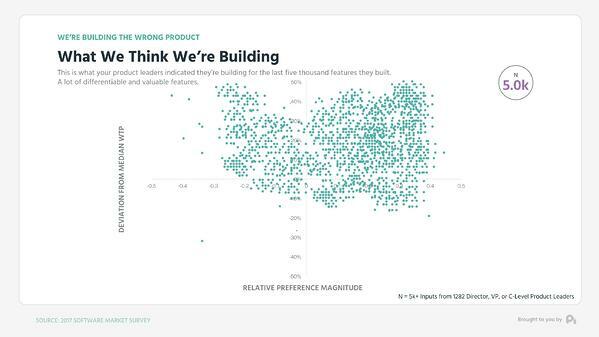 We then went out and asked 1.2 million different customers about their actual willingness to pay and their actual preference for features using our statistical models, and this is what they indicated you’re actually building. Essentially your product teams are extremely confident they’re building value when in reality they aren’t and they don’t even know they’re doing this, because you’re not talking to your customers. As CAC increases, the relative value of features declines, and growing a business just becomes that much harder, we’re in a world where we’ve literally been given the answer to success - understanding our customer - not always agreeing, but at least understanding, and for the most part we’ve turned our noses up at the notion of actually talking to the people that are ultimately paying us. That’s a scary thought. Well, that's all for now. If you have a question, ship me an email or video to pc@profitwell.com and let's also thank Adam from ThriveHive for sparking this research by clicking the link here to share and give him a shoutout. We’ll see you next week.